In January of 2011, when Bill Allen's first middle-grade/YA book, How to Slay a Dragon, was published by Bell Bridge Books, a date was set for the release of the second story: a date of January, 2012, a full year away. It looked as if the full Journals of Myrth series would not be available for two more years. What's worse: Bell Bridge Books began to grow, and soon they were handling far more authors and titles than anyone would have predicted. Consequently the second Journals of Myrth story, How to Save a Kingdom, arrived slightly late, debuting in February of this year instead of January. But then plans were announced to release How to Stop a Witch, the third (and last?) of the Journals of Myrth series, by August. Having just those revisions ahead of him, plus the full-time job, his web master duties, his Space Coast Writers' Guild responsibilities, his feeble marketing efforts, and his busy family life, Bill was desperate for something to do. 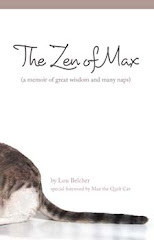 He introduced Orson Buggy's Lessons for Losers, the first of a new Bumpy Daze of Orson Buggy series for middle-grade readers, in April of this year, then dusted off one of his older works and put out Hanging by a Thread a month later. 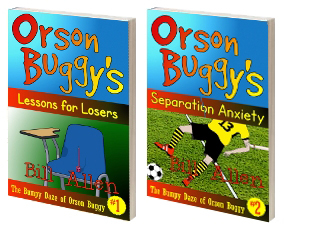 Now, well before the holidays, he has released the fifth and final book of 2012: Orson Buggy's Separation Anxiety. According to Bill Allen, it's guaranteed to make you chuckle.